A Republic of Disrespect America’s partisan divisions spread to international relations. It’s odd in Washington now. There’s a lot of claiming of authority and no taking of responsibility. The president gave his State of the Union address, and of course the TV ratings were bad—Nielsen put viewership at 31.7 million, the lowest since Bill Clinton ’s last State of the Union, in 2000, when America had 38 million fewer people. Although the low ratings are generally attributed to President Obama ’s no longer being new and a symbol of hope, there’s more to it, such as a lack of credibility. Mr. Obama sturdily declared that pages have been turned and crises surmounted. He has become a better actor in his presidency, with better command of and engagement with his material, but the material reflected nothing new in terms of his essential attitudes. He quickly glossed over the Islamic State: “In Iraq and Syria, American leadership—including our military power—is stopping ISIL’s advance.” I liked the “including our military power,” but: Really? Few on the ground see anything but an Islamic State on the move. Literally as the president spoke, Yemen’s government was falling to Iranian-backed groups whose takeover is assumed to be good news for an al Qaeda branch poised to fill the void. The president’s habit of detaching from what is actually happening—of declaring in fact that the opposite is happening—is a marvel to behold. History will speak of it. 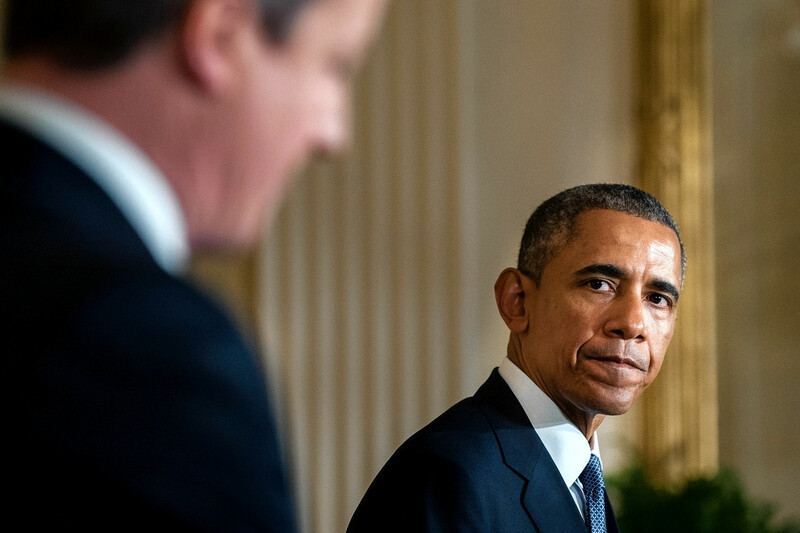 Prime Minister David Cameron and President Barrack Obama at the White House, Jan. 16. After forgetting to be gracious to the victors of the 2014 election, or even to note there’d been a significant election, he referred to his relations with Congress. “Imagine if we broke out of these tired old patterns. Imagine if we did something different,” he said. “A better politics isn’t one where Democrats abandon their agenda or Republicans simply embrace mine.” It is instead one “where we appeal to each other’s basic decency instead of our basest fears.” Well, OK, but before this sweet hectoring he had sternly threatened to veto Republican-backed legislation. ( CBS News ’s Mark Knoller counts nine veto threats since the new Congress was sworn in Jan. 6.) Somehow Mr. Obama’s olive branch always looks like a blunt instrument. He has spent the past six years blaming Republicans when he wasn’t ignoring or dissing them, and despite some nice touches in the speech, his essential disrespect for his political adversaries shone through. He hates them. They hate him back. On the Republican side we see disrespect toward the president—and, more consequentially, toward the presidency—in the decision of GOP Hill leaders to invite, without conferring with the White House or the State Department, a foreign head of government, Israel’s Prime Minister Benjamin Netanyahu, to address a joint session of Congress next month. On hearing of this I got the same sinking feeling I did last week when Mr. Obama met with British Prime Minister David Cameron at the White House and, during their joint news conference, Mr. Cameron acknowledged to reporters that he’d personally lobbied U.S. senators to back Mr. Obama on Iran sanctions. Should a foreign leader be on the phone jawboning with members of the American Congress about what they should or should not do? Um, no. It’s a breaching of diplomatic form and tradition. You go run your country, we’ll run ours, and then, because we’re friends and allies and love each other, we’ll meet and talk and see if we can’t get into agreement. Mr. Netanyahu is welcome to visit and speak to Americans anytime he wants, but Congress’s invitation, like Mr. Cameron’s lobbying, is a violation of diplomatic form, tradition and expectation. The United States has an elected president who serves a four-year term, and in that time he gets to conduct the nation’s formal diplomatic efforts and policy and to oversee its foreign-affairs apparatus and agencies. Does Mr. Obama deserve to be embarrassed in this way? Of course he does! In his long years in the presidency he has demonstrated no regard for the Republicans of Congress, and now they are showing no regard for him. But it is still a bad move, a damaging snub that makes divisions more dramatic, and not only between Congress and the president. Mr. Obama is forced to decide whether to invite Mr. Netanyahu to visit the White House while he is in Washington. The White House announced it will not, pointedly attributing the decision to “the proximity to the Israeli election.” This too is a snub, and it is hard to see how it does anything to fortify U.S.-Israeli relations. Worst of all is the costly precedent the invitation risks setting. When the Democratic Party wins a majority in Congress, and someday it will, it can do the same thing to a Republican president—bring over for a great joint session address, at a dramatic moment, a foreign leader with whom that president is in opposition or deep tension. I close with an admittedly odd jump, but it’s about something I couldn’t get out of my mind when I thought of the conspicuously odd moments in Washington this week. At a congressional hearing on Wednesday, someone decided it would be amusing or helpful to unleash a small drone. The House Committee on Science, Space and Technology was meeting and suddenly the drone was flying around the front of the wood-paneled room, released by a young marketing executive from a company called 3D Robotics. The committee’s chairman seemed startled on the C-Span recording, though it appeared he gave permission for the display. The drone was a flat, plastic thing with an evil little buzz. What I thought as I watched was: It would be nice if Washington would do one big thing in the next few weeks—see to it that since everyone now has recreational or commercial drones, we can come up with a way to control their use in and around airports. Actually, what I thought was: Someday one of them will fly one into the engine of a 757 like a gaggle of New York airport geese, and we’ll all hope Sully Sullenberger is at the controls. They could do that if they were willing to take responsibility.